Perfect for anyone who suffers from dry, damaged and over-styled hair, the Moroccanoil Moisture Repair 500ml Duo Set helps to restore moisture levels and leave your hair with a healthy shine. Moroccanoil Moisture Repair Conditioner 500ml: Formulated with the same ingredients as the matching shampoo, it gently de-tangles and reconstructs your hair to get it back in prime condition. 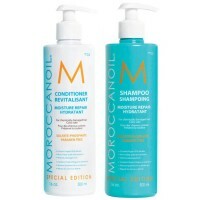 Rich and luxurious, your hair will be left wonderfully soft and easy to manage.